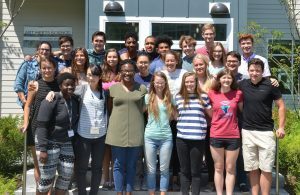 Every year, the MDI Biological Laboratory welcomes hundreds of students, physicians, and science professionals to its campus for training programs and research fellowships. All our students and course participants enrich each other and the Laboratory. As our alumni, they make a difference in their chosen fields and extend the MDI Biological Laboratory’s global reach. The MDI Biological Laboratory is changing and growing, but remains the vibrant, collegial community you remember. Please stay in touch! Have you recently moved, graduated, or taken a new job? Let us know what’s going on in your life. You can share your news by contacting us (207-288-9880, ext. 105), or writing us on Facebook, Twitter, LinkedIn, or Instagram. Better yet, come visit and deliver your news in person. We’d love to see you again. Special events—lectures, symposia, etc.—are an integral part of the MDI Biological Laboratory experience and provide wonderful opportunities for alumni to reconnect. As an alum, you are welcome to attend any of these events. Alumni are welcome to visit at any time. As former summer fellow Ann Epstein put it: “‘Up-in-Maine’ is a state of mind that travels, and let’s us all travel back, again and again.” We would love to see you! Please let us know when you are coming, and we will arrange a special tour of our facilities.